Naturalized in California. Present in 33 counties according to Calflora. Also naturalized in many northern states (USDA Plants) and in South America. Naturalized in California. Present in 33 counties according to Calflora. Also naturalized in northern states in areas which are climate matches to California. In its introduced range, A. pratensis has been reported as invasive in parts of Australia, Alaska, Denmark, Faroe Islands, Iceland, Norway and Sweden (CABI Abstracts). In its introduced range, A. pratensis has been reported as invasive in parts of Australia, Alaska, Denmark, Faroe Islands, Iceland, Norway and Sweden (CABI Abstracts). A few of the areas where it is reported as invasive in Australia are climate matches to California. Blackgrass (Alopecurus myosuroides) has been listed as a noxious weed in the state of Washington, one of the states where winter wheat is a major crop. The areas it is reported for in Washington match the California climate according to the Cal-IPC climate map. While there are some areas outside California with climate matches to California within meadow foxtail's distribution, greater than 50% of the areas in GBIF are located further north in Europe, or in areas of Australia and South America which do not match California. In its native range, this species has been recorded to form dense swards that allow very few grasses and herbaceous species to thrive with it, decreasing the biodiversity. In northwestern North America, A. pratensis has been found to spread in large montane meadow complexes and wet areas, to the detriment of native plants (CABI). There is no information on fire and this species. Since it is a perennial grass of wetland areas it would not be likely to promote fire. A. pratensis is not poisonous and is planted for livestock feed. 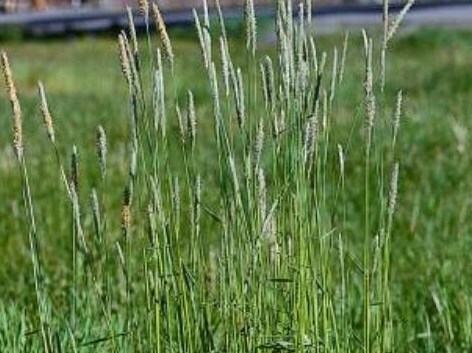 A. pratensis is a perennial grass which grows to 30 inches tall, so would not form an impenetrable thicket. A. pratensis can reproduce by producing both a large number of seed and vegetatively from rhizomes (CABI). A. pratensis can reproduce by producing both a large number of seed and vegetatively from rhizomes. There is no information available on the number of seeds produced per plant, but it does form dense stands and produces a large amount of seed per acre. The seed production is between 200 and 400 pounds per acre (El Bassam 2010). N. Bassam, E. (2010). Handbook of Bioenergy Crops: A Complete Reference to Species, Development and Applications. Under laboratory conditions seeds are able to germinate three months after harvest. Germination percentages for 8 biotypes studied were between 18 and 78%, with 7 of the 8 biotypes at 24% germination or above. However, these results do not directly apply to the field behavior of the plants. LENESCHI, V.., & COJOCARIU L.. (2010). RESEARCH ON SEED GERMINATION OF ALOPECURUS PRATENSIS L.. Research Journal of Agricultural Science. 42(1), 470–476. A. pratensis plants produced mature seeds after three months. Lopp, J., & Sammul M. (2016). Benefits of clonal propagation: impact of imported assimilates from connected ramets. Plant Ecology. 217, 315–329. Flowering occurs in May and June in California. There is no evidence for seed dispersal by mammals, birds or domestic animals. The light and fluffy seeds of A. pratensis may be carried for some distance by air currents. Information was not found on the distance the seed can be dispersed. A pratensis is also found in moist meadow areas so seeds could be dispersed by water. There is potential for seeds to contaminate grass seed and straw which could lead to its introduction into new areas (CABI). Reviewed by Lynn Sweet and Chris McDonald.